Having been to several seaside cities around the world, I can truly say that La Jolla is one of the most beautiful destinations by the water. Once you head down Torrey Pines Drive from the north, you are immediately greeted by spectacular ocean views. With its European vibe, La Jolla is an amazing vacation destination and a must-do and see stop in San Diego. And, yes! You should take the kids. Here are some fun things to check out with your children. Avoid driving down Prospect (as it tends to get backed up with traffic), aiming to drive down Girard instead to the north and check out the Cove to see the seals! Walk out along the bridge surrounding The Children’s Pool (just a name, not an actual pool and, well, kids aren’t even allowed to swim there) for not only a better view of the barking sea mammals, but to get a little sprayed by an up close view of the waves! Walking in the westerly direction from The Children’s Pool, stop off at the tide pools to (cautiously) touch a sea urchin or two! Hop along from section to section to track just how many creatures you can find. 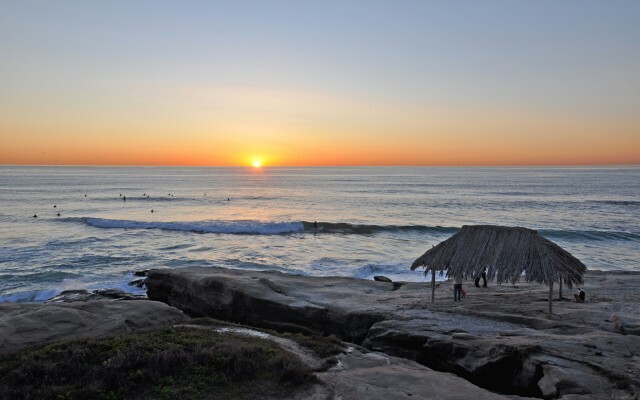 Since the cove waves can be a tad unpredictable (read: be prepared to get wiped out), head to La Jolla Shores for gentle waves that are a lot of fun for the first tries at boogie boarding or just play in mellow water in general. While at the shores, pick up your kayak rental and paddle your way toward the caves! Either take a guided tour or explore the seven caverns during low tide on your own. And keep your eyes peeled as a seal or two may swim along side you! If you are like me, you will skip this adventure, but May through October, apparently harmless leopard sharks visit La Jolla Shores and you can allegedly (kidding…kind of) snorkel safely as you get a (too close for me) personal view that many families I know enjoy the thrill! When you are ready for dry land, check out the Museum of Contemporary Art located on Prospect Street. Always a funky, fun time, it also has one of the most amazing views! And be sure to check out the store for some of the most unique souvenirs. Heading to one of the most popular local surf spots is a must! Sit atop the cliffs as you watch the waterman get barreled. Though a well-liked beach destination, you may want to think twice before letting your kids jump in as the shore break can pummel even the most seasoned swimmers if not timed right. Be sure to hit the Busy Bee’s, a favorite spot for coffee, bagels and pastries to enjoy as you check out the surf. Make sure either on your way in or your way out to check out the infamous top of Mount Soledad! Though the cross at the top that was built-in 1913 has long been a source of controversy, you and your kids will love the picturesque scenery from atop the “mountain”! This entry was posted in Family Vacations and tagged la jolla by Chelsea. Bookmark the permalink.